Kill Strain has been given a release date on PlayStation 4. 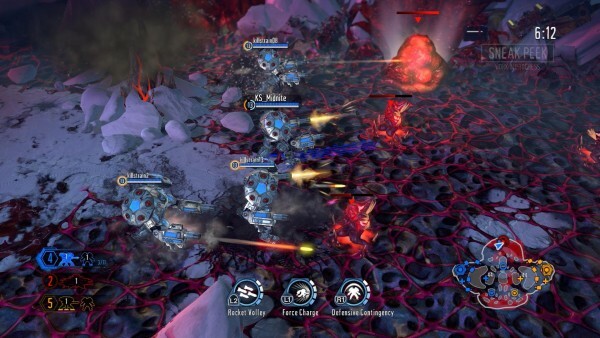 Kill Strain, the PlayStation 4 top-down competitive multiplayer shooter, finally has a release date. Developed by Sony San Diego, the free-to-play twin-stick shooter was announced at PSX 2014. Kill Strain will be out July 12 for PlayStation Plus members, and July 19 for everyone else. The game is currently in closed testing, but the developer will be opening it up for more players. From June 29 to July 3, large waves of invites will be sent out to those who signed up through the official site. You can still register for an invite. If you do manage to get in early and reach level 20 before Monday, July 4, you’ll be rewarded with an exclusive in-game item called The Vanguard Vincent.